Happy Lemon provides a revolutionary unique taste among their costumers which gives them numerous reasons to patronize their drinks. The flavors are catchy and the prices were so much reasonable. There are revolutionized milk teas, coffees, mousses and cocoa drinks. 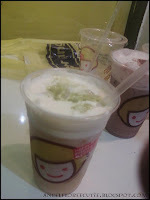 I have tasted two drinks both from The Promenade branch located at San Juan, Greenhills as we visited the place twice. The first one, Cocoa with Rock Salt and Cheese I ordered from my curiosity of it having read about it on a blog review and being so much intrigued of how rock salt and cheese taste mixed in cocoa which you would say is sweet and a bit bitterly so I made it a mission to have it be the first drink from Happy Lemon that I should taste. The food blogger said that the secret with this drink was to never mix it and just make the rock salt and cheese dissolve so I did it and I proved that so true. The recent one, Lemon Green Tea was the most unique green tea I ever tasted. You can’t easily find a taste like that and it’s neither sweet nor bitter but you’ll going to say it is like some tea from concocted fragrant flowers and it’s an invigorating fragrant drink. Never did I mix the condensed milk on top at first until I’m done drinking halfway. It quenched my thirst I acquired from walking and cheering. The ambiance is cozy and is very ideal for chatting and having laughs with friends but sometimes the place was filled with overflowing costumers and the seats were all occupied but it was very worth it. The lighting and wall colors syncs dramatically and is very light for the eye which contributes to relieving stress and producing a lively feeling.